I'm asking for a small commitment after last week's vacation. Digital photography's predictability makes us soft. So build a pinhole camera—it's neither hard nor expensive, promise—and take a photo with it. No more whining about lacking fancy equipment! Build a film-based pinhole camera (or use one you may have already built) and take a photo. Develop the film and send your favorite shot to us. (Note: There are digital hacks out there, but this week is film only.) Also, send a photo of your pinhole rig along with the shot. That photo, of course, can be taken on your digital camera. 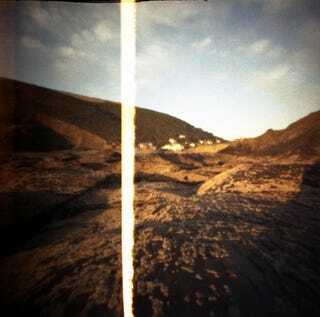 The pinhole camera is one of the simplest gadgets known to man. It's really just a light-proof box with a hole in one end (in lieu of a lens) and film on the other. Pinhole cameras are remarkably versatile, taking photos in seconds, hours or days, all using the same fundamental principle. Years ago, the technique required a lot of trial and error. But thanks to the collective knowledge of the internet, you can shoot a bit less blindly, with the instructions and experience of others guiding you. So don't be intimidated. Pinhole cameras are as dumb as cameras can get. This template/tutorial for a 35mm pinhole camera is remarkably easy to build—and thanks to a design that winds film from one spool to another, you won't need fancy dark rooms or photography paper to develop your photos. You can take the reel to any developer for processing (though, note that you may be shooting a bit beyond the normal 35mm frame). Plus, and this is helpful, the tutorial includes an exposure chart. This other plan is even simpler. You use a matchbox to link two 35mm spools. The result if a bit less point & shoot camera-like, but the attached flickr gallery proved this system has proven merit. And of course, use any other rig you like. Share your favorites in the comments, as well as any tips you might have. 5. Include 800px wide image (200KB or less) AND and an 800px shot of your rig in the email. Send your best entries by Monday, May 24th at 7AM Eastern to contests@gizmodo.com with "Pinhole" in the subject line. Save your files as JPGs, and use a FirstnameLastnamePinhole.jpg (800px) naming convention. Include your shooting summary in the body of the email along with a story of the shot in a few sentences.